i Click 'view all' to instantly compare this good deal with offers on other top women's watches. 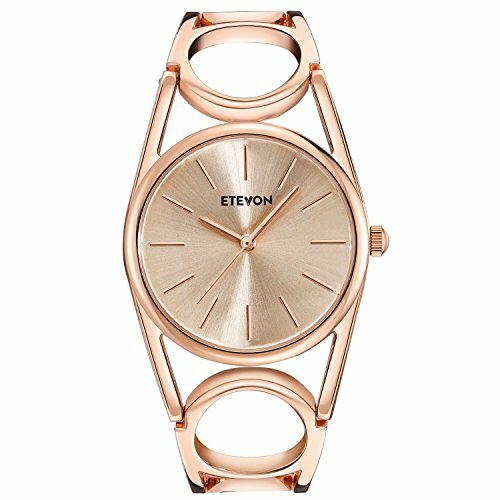 ETEVON Women's Quartz Rose Gold Wrist Watch is currently selling at $19.99, approximately $0.03 lower than average, giving a potential saving of $20.00 right now. With a lowest price of $19.99 and an average of $20.02 it is selling on the low end of its usual range. Price volatility is 0.74% (meaning it does not change often), so the price should stay low for a while. Right now this product is a recommended 'good deal'. The current deal is also the best price on this item over the last month. Compare the current price, savings (in dollars & percent) and Buy Ratings for the top Women's Watches that are closely related to ETEVON Women's Quartz Rose Gold Wrist Watch. Here is how ETEVON Women's Quartz Rose Gold Wrist Watch compares with other leading Women's Watches. Features 1.Fashion Simple Dial : The watch hands and the markers are all slim and long, simple but graceful. 2.Bright Sun-like Surface : The dial surface is covered with rose gold-toned metal after wire drawing process, brightly in the day, just like the sun shining on your wrist. 3.Unique Hollow Bracelet : The bracelet uses circular hollow design symbolizing the arch bridge of love and making your wrist slimmer and exquisite.4.Water Resistant for Daily Use : In general, withstands splashes or brief immersion in water, but not suitable for swimming.5.Fashion Dress Matching : The elegant watch is fitted for different styles of dress. Perfect for all kind of business, casual, indoor and outdoor activities.Materials: 1.Case: Stainless Steel Metal 2.Band: Stainless Steel Metal 3.Window: Mineral Glass (Scratch Resistant) Specification: Dial Color: Rose Gold-Tone Dial Case Diameter: 1.26 inches Dial Case Thickness: 0.31 inches Band Color: Gold Band Width: 0.59 inches Band Length: 7.09 inches Band Clasp Type: Bracelet Clasp Watch Weight: 1.45 ounce Circumference: 6.7 inches **Note** 1. Please DO NOT PULL OUT any button in the water 2. If mist or droplets found inside watch surface, please contact manufacturer immediately 3. Clean the strap by a soft cloth on regular bases is highly recommended 4. Too much water contact will shorten the life of watch What's in the gift box: 1.ETEVON Rose Gold Bangle Watch 2.Warranty Card Features?UNIQUE ELEGANT DESIGN : The watch features with rose gold-toned watch case with simple display design and unique round-hollowed bracelet. Perfect for all kind of business, casual, indoor activities and daily use?GIFT PACKAGE READY : Comes in an elegant gift box. No wrapping needed. Perfect gift for Mother's Day, Anniversary Day, Valentines Day and Birthday to your girlfriend, wife and mom?WATER RESISTANT FOR DAILY USE : Hand washing, splashing and raining are all no problem. NOTE: Please DO NOT IMMERSE IN WATER CHRONICALLY?HIGH QUALITY COMPONENTS : Imported Japanese quartz movement provides precise and accurate time keeping. Japanese long-usage battery, scratch-resistant mineral glass, stainless steel back case etc.